Visit Chattanooga, then get out of town and stay in a log cabin on the Ocoee River, just 45 minutes away. This beautiful cabin is located just 5 minutes from the Ocoee River Scenic Byway and entrance to the Cherokee National Forest. Our Ocoee Cabin is a two-story log cabin situated on the banks of the scenic Ocoee River. A cathedral ceiling and a 'wall of windows' provide guests with an unobstructed view of the river which is less than 40 feet from the cabin's large front porch. Interior walls and floors are finished with knotty pine boards to maintain the authentic cabin experience. Our cabin combines the seclusion of a rustic woodland retreat with the luxury of beautiful furnishings and appointments. The focal point of the great room is a large stone fireplace with handcrafted log mantle. Directly across the great room from the fireplace, a sunken 2-person Jacuzzi tub sits in an alcove surrounded by windows, offering the ultimate relaxation spot. Bring your favorite book, beverage, or maybe a guitar to the front porch and enjoy the serene environment. Guests have reported seeing river otters, ducks, beavers, eagles, and giant blue herons all tending to their business along the river. The Ocoee House is a romantic and cozy retreat for a couple, small family, or you and a few friends. A private downstairs bedroom features a queen size bed. The open loft bedroom has a double bed, twin bed, and twin trundle bed. Additional sleeping is provided by a full-size futon with spring mattress in the great room. The cabin has one bathroom with a shower. The cabin has a fully-equipped kitchen with everything you need to cook in, or you can venture out to one of several casual restaurants in the area with wonderful local flavor. Only 5 minutes away, the 'Ocoee Dam Deli and Diner' has earned wide-spread popularity for serving delicious fresh food in a fun and unique environment. And if Mother Nature doesn't provide enough entertainment, the cabin has a 32' Samsumg flat-screen TV, DVD player, movie library, Sony CD player/radio with iPod dock, and games. We do not have cable TV but Antenna TV which gets about a dozen channels including ABC, CBS, NBC, Fox, and PBS. On our property, you can fish or swim from the riverside dock, play a game of horseshoes or basketball, explore our walking trails through the woods, or enjoy a warm fire under the stars in the outdoor firepit. Offering 'the best of both worlds', we are located at the edge of the Cherokee National Forest, but only 45 minutes northeast of Chattanooga (via Cleveland). In the national forest, you'll find numerous opportunities for outdoor recreation. One of the most popular activities during the warmer months is taking a guided whitewater rafting trip on the Ocoee River, site of the whitewater paddling events during the 1996 Olympics. Guests also enjoy tubing or kayaking on the Hiwassee River, pontoon boat rentals on Lake Ocoee, hiking, fishing, glider rides, horseback riding, zip-lining, or taking a scenic train ride. Then change the pace with a fun-filled day exploring all the attractions, restaurants, and shopping in the fabulous city of Chattanooga! Kevin and Jenny are both Tennessee natives and graduates of the University of Tennessee at Knoxville. We have a 19 year old son, two dogs, and two cats. We love the outdoors and feel very blessed to make our home here in the Ocoee Region. We love sharing our beautiful Ocoee Cabin with guests. This location is absolutely beautiful and suits our family's lifestyle perfectly. The Cherokee National Forest is just 5 minutes away where we enjoy kayaking, hiking, backpacking, swimming, and mountain biking. We enjoy floating from the Ocoee Dam to our property in the summer. When we feel like a little city life we travel about 45 minutes to Chattanooga where we can enjoy shopping, great restaurants, the TN Aquarium, music and art festivals, University of Tennessee events, minor league baseball games, scenic river cruises, and so much more. Also, Lee University is just 20 minutes away in Cleveland and hosts numerous cultural and sporting events. Many of our guests at Ocoee House enjoy the simple beauty of their cabin and surroundings, rarely leaving our property. We have 17 wooded acres where you can take a stroll, cast a line for trout or bass, take a swim, or just watch the river roll by. This cozy bathroom has a lavatory, toilet, and shower. For a bath you'll need to use the Jacuzzi in the living room (there are curtains). This cabin is located at Welcome Valley Village, a log cabin rental resort with 5 cabins total on the Ocoee River. Grocery stores and restaurants are 5-10 minutes away. Mountains to the east of us in the Cherokee Nat'l Forest are seen driving down our street to the cabin. Ocoee Scenic Byway provides access to CNF for more mountain views. Our property is 'hilly'. 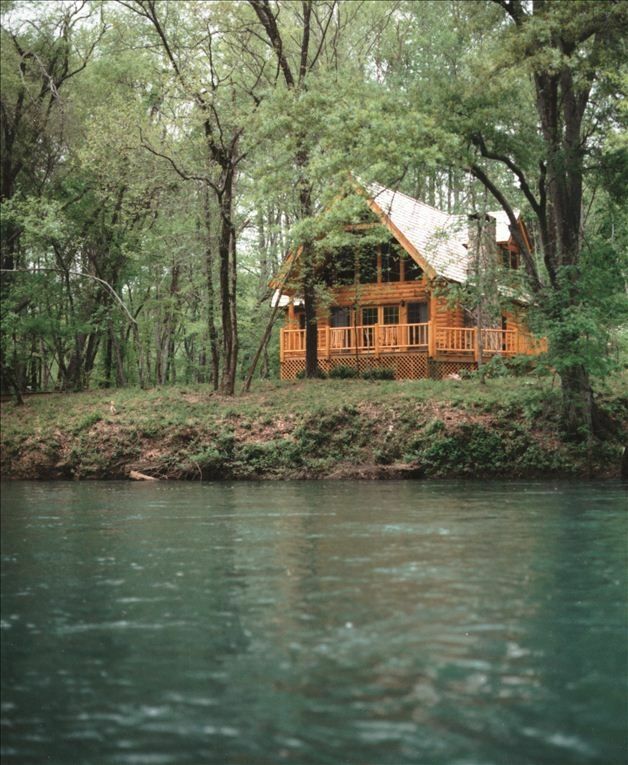 This cabin is located on 1the Ocoee River. A creek draining Todd Hollow enters the river on one side of the cabin, so there is water on 2 sides. A riverside pavilion and dock (shared) are 100' from the cabin. Inquire at the office for landline. Verizon works very well but other providers may be sketchy. Fresh clean linens are provided for your stay. You won't be disappointed. This cabin has WiFi via ATT DSL and is not very fast. It is all that is available to us. A public library 3 miles away has faster internet. Fresh clean towels are provided for your stay. You won't be disappointed. We ask that you bring your own towels for outdoor use swimming etc. Hiking trails, river swimming, basketball court. Also available in the Riverside Pavilion. 14 cu ft with freezer on top. Standard Mr. Coffee; filters are provided. Dishes for up to 8, and plenty of the ordinary things you'd expect to need if you were cooking a meal. Fully furnished with cooking and eating utensils. Also provided: paper towels, napkins, plastic cups, paper plates, dish soap, coffee filters, salt, pepper, sweetener, matches, and dishtowels. The kitchen, dining room, and living room are one big 'great room'. A dining table with 4 chairs is there just a few steps from the kitchen. We receive ABC, NBC, CBS, FOX, PBS and other networks; about a dozen channels in all. Riverside pavilion with fishing/swimming dock, and outdoor campfire pit. The cabin and surrounding area are beautifully landscaped. We also have a basketball court, horse shoe pit, and hiking trails onsite with many more in the Cherokee National Forest just 5 minutes away. There are 5 log cabins here total that share facilities. Dictated rest an relaxation. Allowed us to close out the entire outside world!! The cabin was perfect and the property was beautiful! We enjoyed fishing, swimming, and hiking. It was the perfect family get away and we will definitely be back! We're glad you all had a nice visit. Hope to have you again real soon. Beautiful cabin with an amazing view. Our stay at the Ococee House was wonderful! The cabin is beautifully decorated and in pristine condition. We are a family of six and were all very comfortable. The access to the river just steps from our cabin was so much fun. We all enjoyed our stay, thank you Jenny and Kevin for creating such a beautiful space. We're glad you chose to stay with us. We love sharing our log cabin with travelers. The river is fun to watch for wildlife or for swimming on a hot summer day. The cabin was fantastic and the location was beautiful. We enjoyed the Jacuzzi in the main room overlooking the creek and the view of the river. Very helpful and friendly owners! Would definitely go back. PS- 0 bugs inside. Amazing based on the area! Thanks for sharing your experience. We hope to see you and your friends again sometime if you're in our area. Two days is hardly enough! The cabin is really well built, and nice and clean. We had an awesome stay and got some really good fishing in on the hiwassee river. What a great place to get away from it all! Not one complaint. Had everything we needed! Very quiet this time of year. Hope we get to come back again next year. Thanks for sharing a review! We're glad that you've discovered our wonderful retreat. Hope to see you again sometime. Our Ocoee log cabin is located at Welcome Valley Village (WVV), near the Western gateway to the Cherokee National Forest on Highway 64, and is about 15-20 minutes East of Cleveland, and 45-50 minutes North and East of Chattanooga. If approaching our area from the west, or coming up GA Hwy 411 from Atlanta, you'll begin to see the mountains in the CNF getting closer and closer. You'll begin to see numerous adventure companies along the highway offering whitewater rafting trips, ziplines, and horseback riding. After crossing the Ocoee River, take your first left hand turn onto Welcome Valley Road and our resort is 2 miles on the left. The Ocoee Region is popular with vacation travelers looking for outdoor adventure, scenic driving tours, hiking, mountain biking, boating, or a beautiful quiet spot to retreat to for some rest and relaxation. Within 10 minutes of WVV you will find lots of lovely rural scenery, 2 grocery stores, several restaurants, a zip-line, a corn maze, and nearly a dozen whitewater rafting companies. Our area does not offer a lot of options for shopping but a few are notable to mention. Ms. Be's Purple Bus, on Hwy 64 is a neat place to shop for handmade necklaces, bracelets, bags, clothing, and beading supplies. Benton Shooters Supply, on Hwy 411 in Benton is reportedly the 'largest gun store in the south.' Also, every whitewater rafting company has a gift shop for local souvenirs. There is a 2 NIGHT MINIMUM booking required during Summer and on all weekends, UNLESS only 1 night is available. Some holidays have a 3 night minimum. ONE NIGHT RENTALS ARE CONSIDERED on Sunday-Thursday during all other seasons at our discretion. A booking of 5 or more nights will receive a 10% discount off of the published rates. Base rates cover up to 4 guests. Additional guests are $5/child (2-17yrs)/night or $10/adult/night. We do not take a cash damage deposit upfront, rather you must provide a credit card to imprint at check-in as a Security Deposit. Extra charges for damages are extremely rare.